The Manfrotto Befree is one of the best travel tripods on the market, but it comes at a hefty price. The Manfrotto Befree Advanced Travel tripod is part of a long line of high-quality photo gear. As a brand, Manfrotto is singularly focused on outfitting professional photographers with the gear they need to support their art, their vision, and their business. 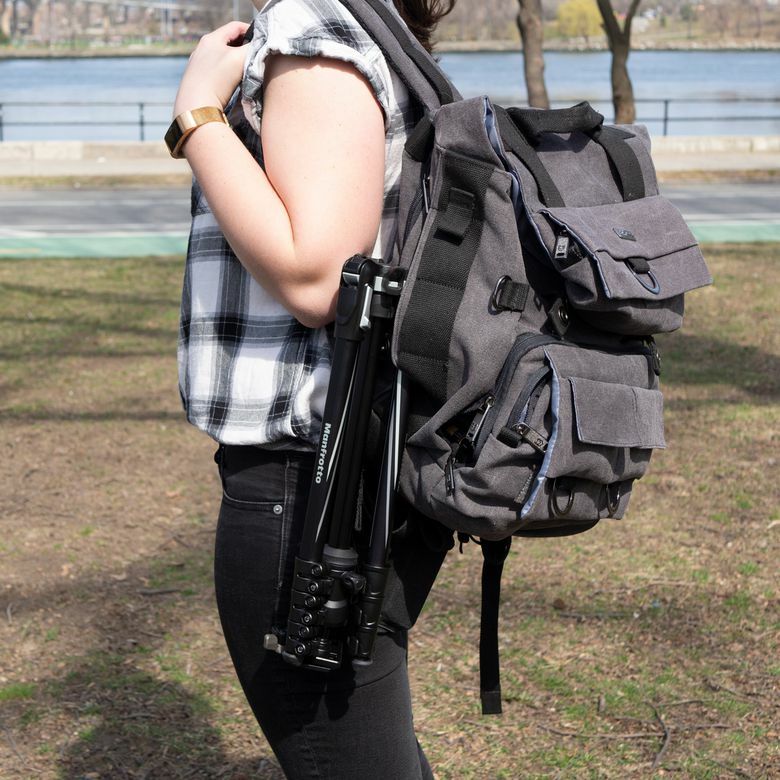 When we tested the aluminum, twist-lock version of the Befree in New York City for about a week, we found it to be one of the best tripods out there, travel or otherwise. But it doesn’t come without its trade-offs—most notably, the high price tag. With a brand like Manfrotto, it isn’t surprising to see the Befree was designed to fit into a discerning photographer’s gear bag. The black unit that we tested features a variety of tasteful silver accents that give the tripod a subtle sense of quality. In fact, the only clearly contrasting color here is the bright red Manfrotto circle logo emblazoned on the mount barrel. You can pick up the Befree Advanced tripod in blue, red, or a more silver-leaning scheme, but in our opinion, black is the way to go. We also really liked the subtle triangular accents scattered throughout (from the rubber feet to the leg-adjusting buttons) that give the Befree a more modern look than the cylindrical shapes of other units. Check out our favorite camera cases and bags. The Manfrotto Befree travel tripod has a lot going for it in terms of functionality. The rubber feet are angled in an intelligent way that ensures they don’t slip when the tripod is in its various positions, and each of the legs has three different clasps and three different levels of length adjustment. The legs also have locking angle selections at 22, 54, and 89 degrees, but we found the slider latch to be a little finicky depending on where you try to push it. The twist lock (Manfrotto calls it the M-LOK system) is interesting as it offers a rounded-edge option for loosening and tightening the top barrel swivel. This takes some getting used to, but it means there isn’t an awkward protruding wingnut to get caught on things. The Manfrotto 494 ball head mechanism is really precise and smooth, but we found the horizontal rotating barrel to be not as fluid as some other models. Finally, the Arca-Swiss style quick release mechanism has a two-point lock clasp, meaning you won’t accidentally knock it loose. The twist lock (Manfrotto calls it the M-LOK system) is interesting as it offers a rounded-edge option for loosening and tightening the top barrel swivel. Where the Befree’s functionality really stands out are the little extra touches. The twistable M-LOK has a secondary knob that allows you to increase or decrease the sensitivity. This lets you loosen the ball head to decide if you want a quick and easy release, or something with more precision. Another cool feature is Manfrotto’s Easy Link accessory attachment that lets you hook up compatible extensions to the tripod, broadening its functionality and versatility. The last point we’ll make here is that there doesn't appear to be a liquid level on-board, so if you’re looking for precision on that front, it will be missing here. At around 3.3 pounds, this Manfrotto travel tripod won’t weigh down your bag. It folds to just under 16 inches in length, which means it isn’t as obtrusive strapped to your travel bag or carry on. We found that because of the thin legs, and the way they fold in at a pinched angle toward the bottom, the weight was a little top-heavy. We found this problem usually crops up if your camera bag straps are around the middle of the tripod. Overall, it’s very small and very sleek, and despite the balance issues, it’s a nice package for travel. The Manfrotto has one of the best constructions we’ve ever seen on a travel tripod. Though the legs are thin, they feel very rigid. The telescoping mechanism is smooth, meaning lengthening and shortening your tripod is seamless and simple. All the clasps and knobs seem very high-quality, and we’re confident they won’t give out any time soon. The Manfrotto Befree Advanced Travel tripod is part of a long line of high-quality photo gear. Manfrotto clocks the weight capacity at 17.64 pounds, which is way more than you’re likely to need, even for grip-equipped DSLR’s. One of the most satisfying aspects of the material front is the rubberized grip on one of the legs. The high-quality, textured rubber Manfrotto used feels great and is extremely grippy, meaning the tripod is easy to grab and go with. Accessories Included: High-quality basics, but no bells and whistles. The Arc-Swiss plate that comes with this package is very high quality. Because the release mechanism feels so tight, we’re happy to say that this is one of the best mounting plates on any of the tripods we tested. The included bag is among the thickest available in the category, serving you well whether you’re just storing the tripod or tossing it into a crowded trunk. One nice addition is the small Allen wrench thrown in for fine-tuning some of the clasps, just in case they loosen over time with use. That’s about it on the accessory front, which is in line with most of the other travel tripods out there. Some might view price as an indication of quality. In this case, the attention to detail and premium feeling of the Befree tripod do seem to support that. But in our opinion, the Manfrotto is just too expensive for the feature set. At almost $200, it’s at the high end when you’re talking aluminum builds, and you don’t get a lot more features than the $100-150 options from other manufacturers. If you’re in it for the brand name, then the price might feel justified to you, but to us, you’re paying for a logo. If money isn’t much of a hangup for you, this tripod will check every box. Vanguard VEO: Vanguard has a whole line of travel tripods that sport nearly identical features, often for half the price. You’ll miss out on some bells and whistles of the Manfrotto here, but that might not be the biggest deal to you. Manfrotto Befree Carbon Fiber: On the more expensive side of travel tripods from Manfrotto, you’ll find the Carbon Fiber options. These will undoubtedly be more durable, but they’ll also run you a good deal more money. K&F Concept 62-inch Tripod: If you’re looking to save money, and don’t mind skimping on some of the build quality, you can get a comparable option from K&F Concept for well under half the price. Among the best you can buy, but also the most costly. It’s hard not to like the Befree Aluminum Travel Tripod from Manfrotto. When you get it in your hands, it feels substantial, offers a ton of customization and functionality, and sports a brand with years of trust from professional photographers. If money isn’t much of a hangup for you, this tripod will check every box. Product Dimensions 17.7 x 4.9 x 4.2 in.